It’s not long until Father’s Day, so if you’d like to make the daddy in your life a little homemade sweet something that’s not too sweet and is, in fact, also a little bit salty, how about some of these…? The lovely people at Lindt recently sent me some of their 70% Cocoa cooking chocolate to try out and so my daughter Mia and I decided to put it to the test by making some chocolates for Daddy. My husband Jason is a big peanut butter fan and it’s the usual topping for his toast in the morning. Following a rather bizarre tip a few months ago from Chris Evans on his breakfast radio show, Jason’s now taken to combining peanut butter with Marmite on his toast. He loves it – something to do with the contrast of the sweet and salty apparently. 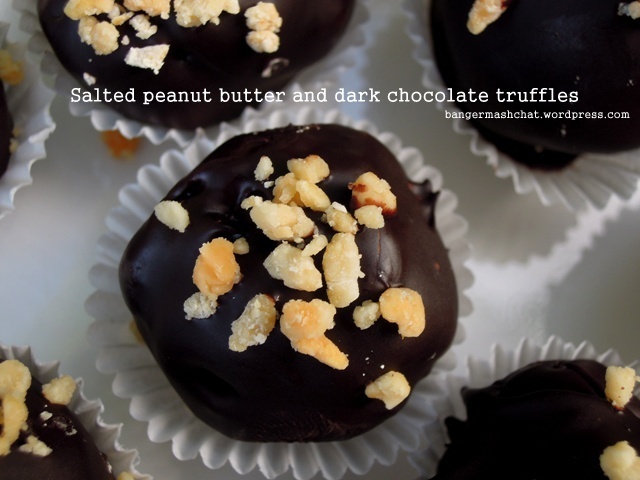 So that’s what gave me the idea for the filling for these chocolate truffles. Don’t worry, there’s no Marmite in there – just a pinch of salt to give that deliciously moreish sweet-savouriness, plus they’re topped with a little sprinkle of chopped salted peanuts too. The gorgeously smooth, dark Lindt chocolate works very well with the crunchy, gooey peanut centre, making for rather sophisticated truffles despite the main ingredient being every little (and big) kid’s favourite. Jason was very happy with his early Father’s Day present. I fully expect the whole lot to be gone by the time I get back home from work this evening. The one thing he said they could do with was perhaps a touch of chilli. He’s a major chilli head as well you see. Maybe next time. In a bowl, combine the crushed biscuits, peanut butter, melted butter, sugar and salt and chill in the fridge for around 30 minutes. 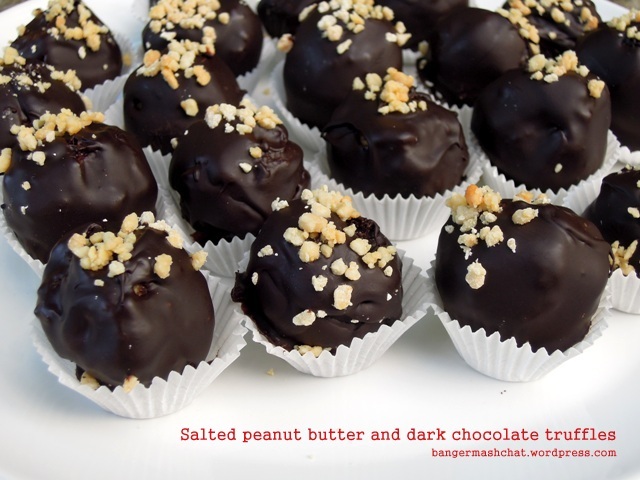 Taking a teaspoonful at a time, shape the peanut butter mixture into balls and place on a baking sheet covered in clingfilm or baking parchment. Freeze for 15 minutes. Melt the chocolate and butter in a microwave or over a double boiler (a bowl placed over a saucepan of simmering water) and mix together well. 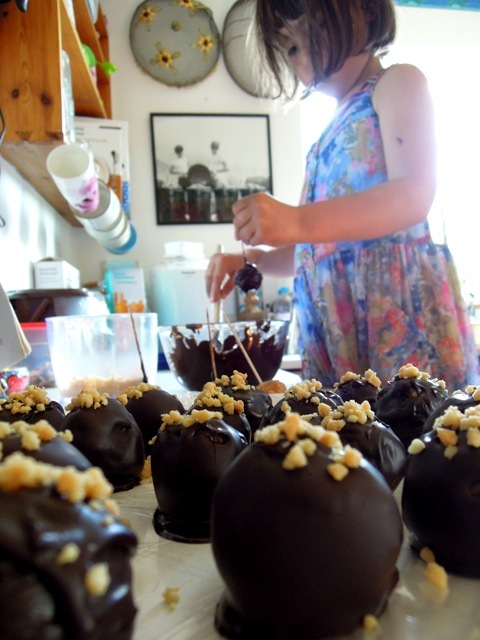 Using a cocktail stick, dip the peanut butter balls into the chocolate, ensuring it is entirely covered. Place on a plate covered in clingfilm and sprinkle each one with some chopped peanuts, working quickly before the chocolate sets. Chill in the fridge before placing the chocolates into petit four or mini cupcake cases. 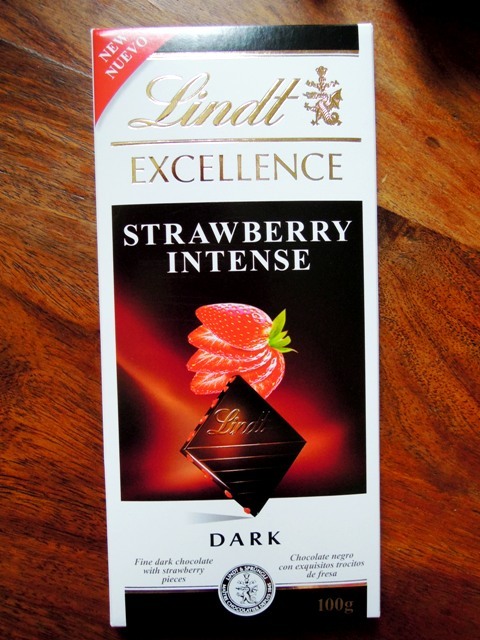 And if you want to give Daddy some chocolate this Father’s Day but don’t fancy making your own, we can recommend Lindt’s Strawberry Intense, another sample they sent us, which is rich and dreamy without being overly sweet. You see their full range of Father’s Day chocolates on the Lindt website. Disclosure: Lindt provided me with sample bars of their 70% Cocoa cooking chocolate and Strawberry Intense. No money exchanged hands and the views expressed here, as they are throughout my blog, are completely my own. OMG!!! 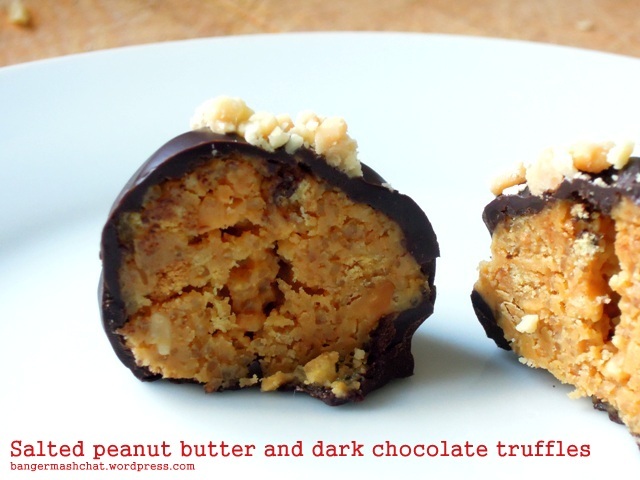 my husband hates peanut butter so I think I might have to make them for myself! I’m right there with your husband on the marmite & pb combo – it does a strange thing too…goes really thick…I love it! my eldest has peanut butter on one slice of toast & marmite on the other…but he refuses to mix it! If you do, please come back and let me know what you think Helen. I’m not too sure about the Marmite and peanut butter mix – doesn’t do it for me. 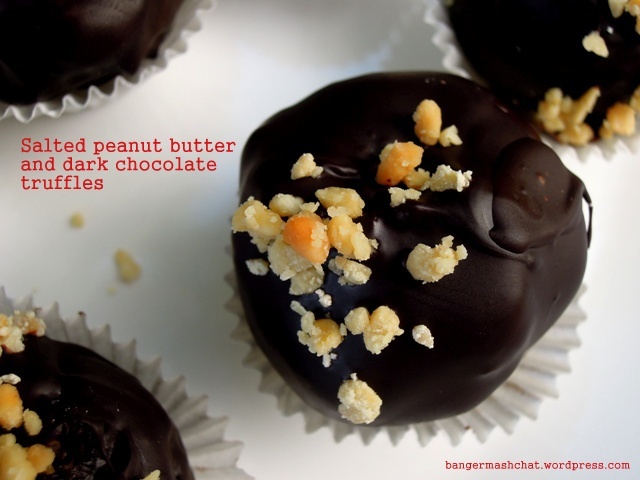 But salty peanut butter wrapped in dark chocolate definitely does! Absolutely gorgeous and delicious looking! I will definitely have to try these. Thanks! Just trying to work out how near the day we will need to make these so there’s any chance of at least one being left on Sunday… they look fantastic! Wow!! Look good enough for mummy too – will definitely try these!!! That chocolate looks brilliantly glossy and they sound delicous. Well done to you both and it sounds like daddy is going to be chuffed to bits. Weirdly my mother has always had marmite on her toast if she’s having peanut butter. I say weird, because I never liked it, but now I’m really into salt and sweet maybe I ought to try it. Thanks Choclette. I’m never sure with chocolates whether to put them in the fridge to chill or not – sometimes they lose their glossiness as a result. But it didn’t seem to affect these chocs at all. I really like the salty sweet combo at the moment. But peanut butter and Marmite together just doesn’t do it for me personally!